About three weeks ago Kwelvis promoted and put on a bicycle show at Mallory Square. 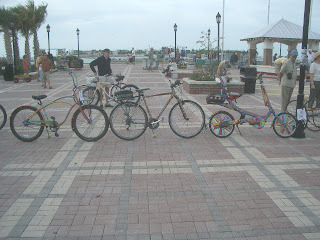 (The three bikes shown were all painted by Captain Outrageous, who had a category all his own in the show, "Captain Outrageous Bicycles". I rode the middle bike over to the show (it belongs to the Captain), while the leftmost one belongs to Marty, he having traded the Captain for it with the rightmost bicycle, CO's most recent bicycle paint job. (He's painted over 2,000 bicycles since beginning this unique style many years ago. Marty took first place in the Captain Outrageous category, Captain came in second, and the bike I rode "also ran", didn't win a prize. Among the prizes CO won was a gift certificate for lunch for two at Buddy Owen's B.O. 's Fish Wagon. Janet and I went to Schooner Wharf this afternoon to drop off presents for some friends who work there, then walked around the corner to B.O. 's to claim our winnings. Janet ordered a fish sandwich and some conch fritters. I had the barbecue pork sandwich, and everything was excellent, tender, cooked just right and nicely spicy. We don't eat out all that often anymore, so we hadn't been in B.O. 's for a few months. We were glad to have a reason to go back. It was nice of Buddy to contribute to the bike show which was to raise some money for kids' programs in the City. I left word with one of the counter staff to let him know that we appreciated all that he does for good causes, and to tell him that we really enjoyed the food. THANK YOU FOR THE GREAT STORY!! !